About 107 kms from the city of Aurangabad, the rock cut caves of Ajanta nestle in a panaromic gorge, in the form of a gigantic horseshoe. Amoung the finest examples of some of the earliest Buddhist architecture, cave paintings and sculptures, these caves comprise Chaitya Halls, or shrines dedicated to Lord Buddha and Viharas or monastries used by buddhist monks for meditation and the study of Buddhist teachings. The paintings that adorn the walls and ceilings of the caves depict incidents from the life of buddha and various Buddhist divinities. 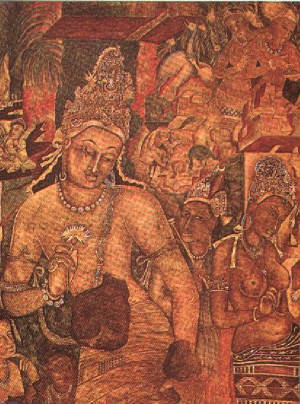 Amoung the more interesting paintings are the Jakata tales, illustrating diverse stories relating to the previous incarnations of the buddha as Bodhisattva, a saintly being who is destined to become buddha.Occupied for almost 700 years the caves of Ajanta seem to have been abandoned rather abruptly. They remained shrouded in obscurity for over a millennium, till John Smith, a British Army Officer, accidently stumbled upon them while on a hunting expedition in 1819. The view point from where John Smith first glimsed the caves, provides a magnificient sight of the U-Shaped gorge and its scenic surroundings.